Relationship: Just Let Me Be Myself! Sometimes we try to bind our partner due to our own limitations and insecurity. This insecurity is fear based in losing our partner, so we use all types of ways that bind in order to feel we have a handle on the situation. Some of the ways we use to bind are: being negative when our partner shares with us, being a wet blanket when he/she is most happy, and not being supportive when we know our opinion matters most. These actions can be perceived as emotional control. We try to bind our partner from growing, restrict socializing outside of the relationship, hinder progress, and we may even try to stifle his/her personality. When we become emotionally controlling this means we are selfish, self centered and jealous. We want our partner to live within our by-laws of limitations in order for us to feel safe and secure. 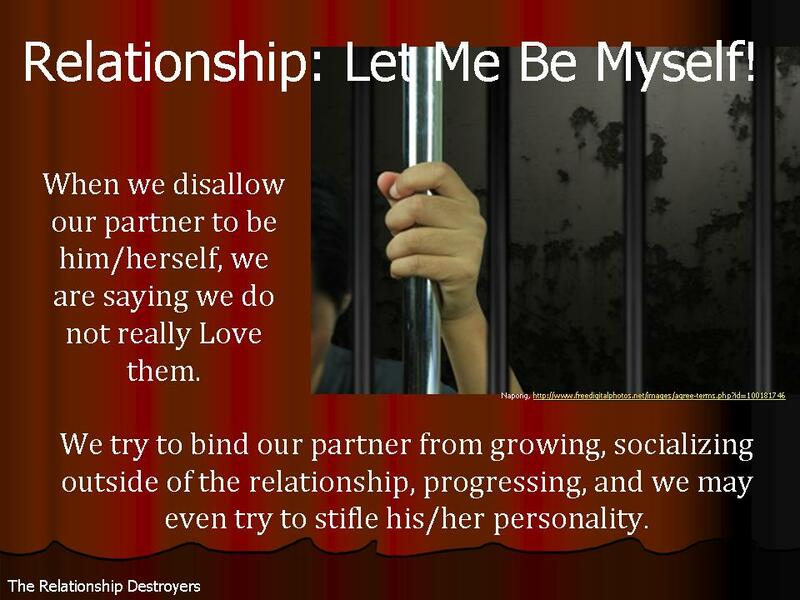 We do not really Love our partner when we devise blockades for the expression of him/her being their true self. Love makes every allowance for individuality. Love does not seek to maneuver anyone to our will, nor to our selfish cause; and more importantly, Love, never forces anyone to choose. If our partner chooses, this is one thing, but if we are giving ultimatums for a choice to be made, that is not Love. Love is not constricting, mandating and dominating. Some of us hate to see our partner looking good and leaving the house to have a good time without us, because we feel slighted. Or we feel threatened in the unknown of whom he/she may encounter while being away from us. We then start an argument, or get uncomfortably quiet, just before he/she goes out in order to ruin the evening. We are lost in the insecure cocoon of how we are feeling. Some enjoy being at home rather than going out. When we choose to stay home and our partner chooses to go out, we feel a ping of jealousy. Do we really want our partner to acclimate to our way? For us to try to bind or change what has made him/her the person we Love, is actually changing the reasons why we love them. Often times the introvert is attracted to the extrovert, and a relationship is formed. It must be understood that the social side of the extrovert, by whom we were originally attracted to, is what our extroverted partner will continue to need in order to maintain what he/she is. The reasons we fell in love in the first place was because of a combination of a smile, look or gesture, style, commonality, touch, or characteristic. How can we choose to be with this person, only to decide during the course of the relationship he/she needs modifications to meet our standards? Did we enter the relationship thinking we can change him/her? Was that the ultimate motive? This type of thinking is taking away from who our partner is. This is the disallowance of true self. Most likely if we are trying to put our partner in a box, it is because we are in a box. What makes our box the best place for anyone? Think about it. We want our partner in a box with us in order for us to feel safe and have him/her in our jurisdiction. Does this ensure we will never lose her? Does this guarantee we will never lose him? We are missing out on the spice of the relationship and the differing dynamics and angles of who our partner continually chooses to be. Rather than being focused on constraining, and being a partner who is a downer; let’s enjoy the variations of what our partner can bring to the relationship. Enjoy him! Enjoy her! Explore the mind and heart of your partner, and see the beauty of who they really are. Take the time to step out of being in a relationship, and be an objective observer of the partner you have. You just may fall in love again. Encouraging our partner to grow, indulging in their joy, providing space for him/her to be alone when necessary, making allowances for a social life, supporting their efforts, allowing personality growth, is a part of a being in a healthy relationship. This entry was posted in Fix Yourself and tagged let your partner be herself, letting your partner be himself, not loving our partner to be themselves, trying to bind our partner, trying to stifle our partner. Bookmark the permalink. 1 Response to Relationship: Just Let Me Be Myself! This perfectly describes how I am being treated. Perhaps I’m not being unreasonable after all in fighting to be me.